This graph shows what happened to murder rates in California after various gun control measures were passed. The positive effects of these measures seem obscure. Transcript of a debate between myself and Police Chief Patrick Rooney on KSRO, concerning liberalization of California's concealed weapon permit law. Fear and Loathing in Whitehall: Bolshevism and the Firearms Act of 1920 is a paper about the adoption of the British Firearms Act of 1920, based largely on British Cabinet papers declassified in 1970. It is startling how terrified the British government was of armed revolution -- and why they adopted restrictive gun control as the solution. I presented this paper at the American Society of Criminology conference in San Diego in November 1997. Workhouses of the early Victorian era, and the ideology and conditions that led to the British Poor Law of 1834. The other paper I did for Modern British History class (see above). An analysis of the roots of the Mexican Constitution of 1824. The Pequot War is a paper I did for a colonial America class about the differing motivations and historical analyses of the Pequot War fought in 1636 between the New England colonists and the Pequot tribe. Want to know more about the start of the Iron Age? This is a paper I did for Ancient Near East. Race and Reporting: The Los Angeles Times in Early 1916 examines how newspaper coverage of Hispanics was influenced by Pancho Villa's raid on Columbus, New Mexico. A response to the Journal of American History article by Professor Michael Bellesiles asserting that guns and hunting were actually quite rare in America before the Mexican War -- even on the frontier. I am interested in criticisms and suggestions; the JAH sat on it for a couple of years -- and then rejected it at least partly because it was a bit late to run a direct criticism of Bellesiles's article. This document has been revised as of 11/19/01 to correct a publication date error in a citation to Journey to America. I used the 1981 reprint of the 1971 edition which was a revision of an earlier edition, and had the wrong date on the first full citation. Professor Bellesiles's book-length treatment of those ideas, Arming America: The Origins of a National Gun Culture (New York: Alfred A. Knopf, 2000) is out, and after a thorough examination of Bellesiles's sources, I conclude that he isn't just wrong--he is intentionally deceiving people. Few of the sources that I have checked actually match what he claims that they say. V5.1 updated 04/04/2001. Unsurprisingly, prestige history journals such as the Journal of the Early Republic consider fraud by prize-winning and influential historians of no interest. Here's the paper I submittted; here's the editor's reason for not even considering it. A very short paper that emphasizes just intentional fraud (not error, or a manipulative misreading) in Arming America is here. It turns out that at least some of the reviewers that were initially quite taken with Arming America have either recognized that they were victims of the fraud (and let's not gloat -- what Bellesiles did is really remarkable for historians in the academic community), such as John Wilson in January/February 2002 Books and Culture, or are at least admitting that there are some serious concerns about Arming America's accuracy (such as Karen Samples's column in the January 12, 2002 Cincinnati Enquirer). The Chronicle of Higher Education held a colloquy on the Bellesiles scandal. Make you read the responses. Some are devastating; some would be funny if the authors weren't serious. 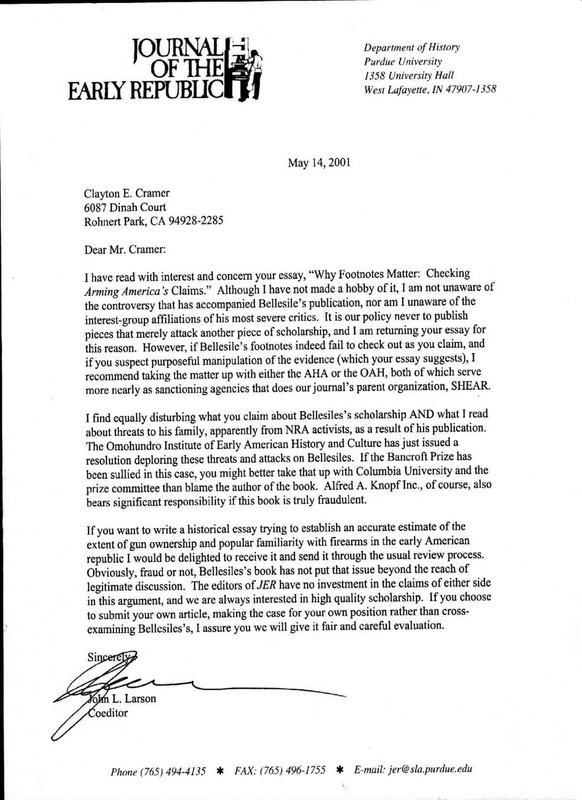 Here is Professor Bellesiles's unbelieveable attempt to defend himself in the Organization of American Historians November 2001 newsletter. Make sure you read the comments by clicking the "Read the Comments" button next to it. Here's a link to the Contra County County Historical Society's page about Bellesiles's "discovery" of San Francisco County probate records in their collection. Here is the draft of Professor James Lindgren's "Fall from Grace: Arming America and the Bellesiles Scandal," 111 Yale Law Journal 2195-2249 [June 2002]. I am pleased to report that my name appears frequently in it! "Five Dead in Arkansas": What Were You Expecting? "How Cheap Do We Want Health Care?" "San Francisco Sues Gun Makers for Failing to Do The Government’s Job"
"The Crisis No One Wants to See"
"Cannibalism as Entertainment" This a joint effort of my wife Rhonda and myself. The Canaries Are Dying More tragic school shootings--and what they say about our society.